These earrings showcase a unique artisan design that can't help but create a buzz! The geometric cuts and elements are fashioned in a flirty combination of platinum and 18 Karat rose gold. 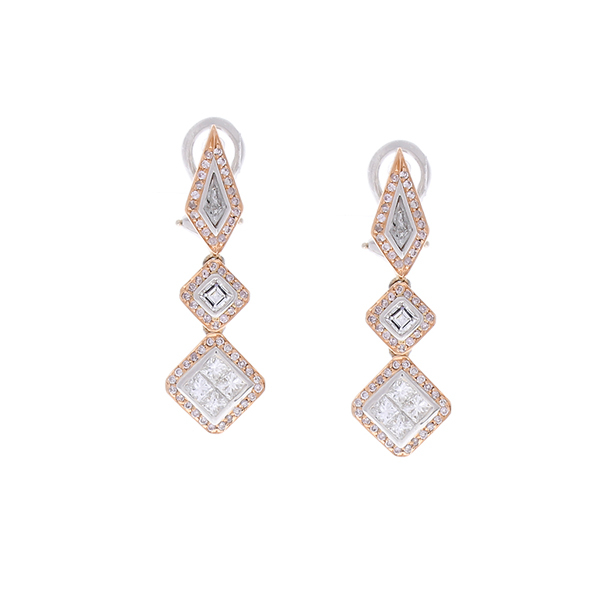 0.51 carat total weight of natural round pink diamonds, 0.85 carat total weight of princess cut, 0.26 carat weight of E-F color, VVS clarity of square emerald cuts, and even 0.17 carat total weight of kite shaped diamonds all work together in perfect harmony to create this intricate pair of diamond earrings that total 1.79 carat total. This attention-getting pair of earrings is sure to get you noticed!